UNITED NATIONS, December 28 -- As protesters massed in front of the UN in Cairo, Egyptian authorities blocked the press from covering the protest or speaking to the protesters. 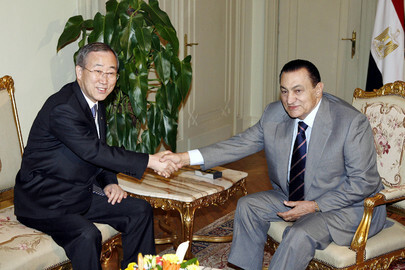 At noon in New York, Inner City Press asked the Office of the Spokesperson for Secretary General Ban Ki-moon, "does the UN have any comment on Egyptian authorities barred the press from filming or speaking with people in front of the UN facilities in Cairo engaged in a protest regarding the Gaza Freedom March?" Four hours later, having heard nothing back, Inner City Press went to the Spokesperson's Office for an answer to this and other questions. The deputy spokesperson asked, which UN building, and indicated that there would be no UN response. Back on December 17, Inner City Press asked an organizer of the Gaza Freedom March about Egyptian policies, and whether the UN is going enough. Video here, from Minute 28:30. The response was generally that "the UN should play a stronger role" (this included in Afghanistan, another of Inner City Press' questions). Video here, from Minute 40:50. The December 28 request for comment, for the record, was not about the Gaza Freedom March in general -- the UN has already no commented on that -- but about a host government interfering with freedom of the press to cover a protest in front of the UN. The silence, then, is all the more striking. Watch this site. 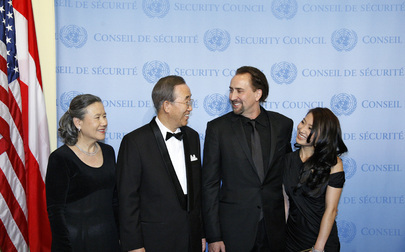 UNITED NATIONS, December 24 -- At UN Secretary General Ban Ki-moon's official residence on December 22, an individual with no invitation and no UN pass crashed Mr. Ban's holiday party, multiple sources tell Inner City Press. They describe Mr. Ban's personal secretary Ms. Kim stopping the individual and being told -- falsely as it turns out -- that the individual works for the UN Department of Political Affairs but for some reason had no pass or identification, and being let in. Ms. Kim asked, "What section?" and was told, "Elections" -- the unit embroiled in controversy following its role in the flawed Afghan election. But despite reason to believe the person was not even from the UN, he passed security into Mr. Ban's residence. The individual even received a gift from Mr. Ban, before proceeding to enter without authorization other UN premises. On December 23, Inner City Press approached Mr. Ban's new spokesman Martin Nesirky on his way to the day's noon briefing, and asked about the incident, even suggesting he ask Ban's secretary Ms. Kim. Nesirky returned to his office and put in an inquiry. Inner City Press put the question on the record during the noon briefing and was promised an answer. Later on December 23, Nesirky tersely e-mailed Inner City Press that "there was no security breach." On December 24, Inner City Press sought and receive additional information, including the identity of the person -- also not invited, but having a UN pass -- who brought the party crasher, and other identifying details. After that day's noon briefing, Inner City Press went to Nesirky's river view office and asked what he had meant, that there had been no security breach. 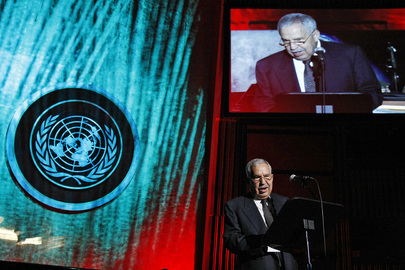 Nesirky said that the UN doesn't discuss security arrangements. When Inner City Press noted that in Washington in the wake of gate crashing at President Obama's state dinner with India a whole Congressional hearing on the topic of security was held, Nesirky said the situations were not at all analogous. Why, Inner City Press asked, because Obama is so much higher profile than Ban? Nesirky said that wasn't it -- without specifying what he meant -- and insisted "there is no story." Nesirky chided Inner City Press for pursuing the issue, and even said he would only ask Ban's office a second time if Inner City Press returned with not only the first but also the last name of the gate crasher. This is pointless, since by two witnesses' account, Ban's secretary did not even write down the person's name. While Mr. Nesirky's deputy reportedly made belated telephone calls Thursday afternoon, seemingly to quiet possible witnesses, Inner City Press called Mr. Ban's office and asked to speak with Ms. Kim, on deadline. After the first transfer, a female voice began and then hung up. When Inner City Press called back, the response was that Ms. Kim was no longer available. Inner City Press left a cell phone number stating it was for a story being written that day, on deadline. The deadline has passed. What Inner City Press finds troubling is that the UN would reflexively claim that "there was no security breach," then would refuse to confirm or deny specific facts about unauthorized entry into the Secretary General's official residence. Relatedly, if these are the UN's answers on an incident at the Secretary General's residence, how are the answers on human rights, peace and security and even environmental issues more credible? Whereas governments and legislatures make for at least some accountability, often in the UN there is no accountability, and it starts at the top. Watch this site. Spokesperson Nesirky: I think you have another question, I’m pretty sure you do. Inner City Press: Okay, I do. No, actually, then I will if I get your drift. It’s… I wanted to… I guess, and it’s something that maybe you’ll have an answer on later today, but some are saying that in yesterday’s reception at the Secretary-General’s residence that there was an unauthorized attendee, and that the personal secretary to the Secretary-General, you know, was aware of this and for some reason it was waived. I wanted to know both what the procedures are, given, in light of the event at the White House at the State dinner for India, what are the relevant procedures at the UN for such things, and is it in fact the case that an unauthorized attendee attended, and what will be done about it? Spokesperson: Yes, you mentioned this as we were passing in the corridor just now. I don’t have an immediate answer for you on this specific incident. And also, in more general terms, I would not wish to go into details about security arrangements. That’s clearly not appropriate, but I can just assure you that the security detail for the Secretary-General is extremely rigorous and they work extremely hard for the Secretary-General’s safety. That’s put in a general context, and the more specific question you’ve raised, I’ll see what I can find out. It’s not something that I was aware of. Further to the Spokesman's response at the briefing to the above, there was no security breach at the SG residence last night. A question is, what does the UN mean by "security breach"? Watch this site. UNITED NATIONS, December 24 -- A UN budget deal was sealed at 4 a.m. on Christmas Eve, just as the building itself began to be gutted. While two countries, Bahrain and Bahamas, managed to get their assessment decreased by a side letter from General Assembly President Ali Treki, Russia and its allies lost a vote about rates of exchange, and only begrudgingly supported the overall deal. Israel called for a vote on support of the Goldstone report on Gaza, and found only a couple of African countries and North Korea to support it. The campaign by Syria and others against Terje Roed Larsen's role in Lebanon never came to fruition. India on the other hand gave a long speech denouncing the upgrade of a human rights liaison post in New York to Assistant Secretary General, but did not call for a vote. Throughout the night, when Ambassador and Treki met and milled around in the UN's basement, Inner City Press quizzed Permanent Representatives and staffers and got increasingly candid answers as the night went on. "This place is a joke," said one South Asian envoy. "We pay too much," said a Latin American. "Bahrain's play was shameful." The live blog is online here. In between the Budget Committee vote at 2 a.m. and the large session upstairs to confirm it from 3 to 4, dozens of Ambassadors toasted with Scotch whiskey and the remains of take-out pizza, wishing each other happy holidays. The Delegates Lounge, a fixture, will close on Christmas Eve for up to two years. During the first part there will be no construction in the space: it will simply lie empty, which the General Assembly next door remains open. "They're just closing it to close it," several delegates complained. Unlike in his first year when despite pleading from Secretary General Ban Ki-moon the U.S. broke consensus on the budget, Wednesday night Mr. Ban was nowhere to be seen. Ban's Controller stood BlackBerrying in the basement. Later his Under Secretary General for Management sat on the Budget Committee podium without saying a word. She left before the GA vote. Inner City Press asked about India's argument that using the budget process to upgrade particular posts will create a precedent for more sleaze. I don't opine on that, she said. A staffer from the PGA's office said that current holder of the post, American Jessica Neuwirth, will not benefit from the upgrade. "She was only brought in for eleven months," he said. So who will get the post, after all this hoopla? The evening -- or early morning -- ended with Myanmar denouncing criticism of its human rights record, but vowing as part of its foreign policy to continue to cooperate with the Secretary General's "Good Offices." The occupant of that post, Ibrahim Gambari, has been re-assigned to Darfur, for reasons as much budgetary as political. At the UN it is hard to disconnect the two. Happy holidays. UNITED NATIONS, December 23-24, updated below -- As the UN budget process moved into what should be its final night, Permanent Representatives milled around basement Conference Room 8, amid cigarette smoke and furniture set to be moved out the next morning. Beyond the two issues on which Inner City Press has so far exclusively reported -- the requests by Bahrain and Bahamas to pay less, and India's opposition to upgrading a human rights post -- the issue was when and how to review the scales of assessment. The 130 developing countries in the Group of 77 demand no review for the next three years. Western countries and other some others, who feel their ox is gored, are pushing for faster review. Mexico's delegation, for example, point out that they pay "over fifty percent of Latin America," even after suffering swine flu and a decrease in tourism. The Group of 77, which fell into some disarray during the climate change talks in Copenhagen, remains united in the UN Budget committee. They have thrown their weight behind Bahrain and the Bahamas, who are predicted to prevail in being dropped in peacekeeping assessment from Category B to C, with a 7.5% discount. Despite India's objections that human rights are being conflated with supporting an upgrade of a post, it is suggested to Inner City Press that "India will back down." President of the General Assembly Ali Treki has already met with Ambassadors, then retreated to his second floor office. One of his advisors remains in the basement, glad handing the chairman and secretary of the Budget Committee. There was talk of Secretary General Ban Ki-moon, who stayed hidden throughout the first budget vigil of his Secretary Generalship, waiting in the wings. For the U.S. delegation, beyond their long time bow tied representative, Alejandro Wolff is in the basement, there's no sign of Susan Rice. Inner City Press asked Ambassador Rice earlier on Wednesday for the U.S. view on the budget, if she is satisfied with her Mission's level of involvement, and whether like at least her last two predecessors she believes the UN budget is too piecemeal, not transparent enough. Ambassador Rice replied that of course she is satisfied with her Mission's performance, and that the U.S. is very involved in making sure Missions get enough resources. But what about the when to review the scales of assessment? More fundamentally, what about the piecemeal budget process in which "add ons" comprise more than $1 billion? More blogging to follow: watch this space. Update of 7:27 p.m. -- the basement is still full of Ambassadors, but UN TV keeps showing live shots of the empty General Assembly chamber upstairs, in front of which four Security officers are posted. In the cafeteria, the chairs and tables are being carted away. Some the basement furniture, too, will be on the move. An African Ambassador stops to tell Inner City Press that "the PGA would be wise to re-schedule the plenary for 10 a.m. tomorrow." Update of 7:45 p.m. -- in the Delegates Lounge, Deputy Permanent Representatives are lifting a glass on the last, or next to last, night of the UN bar. "They're at the level of Perm Reps down there," one tells Inner City Press. "Let them earn their money." Update of 8:10 p.m. -- even countries' Budget Committee experts are no longer in the loop. "My Ambassador is in there," one tells Inner City Press, gesturing at the entrance to Conference Room 8. "But I don't know where things stand." In the interim, Inner City Press has dug into who it would be, who would get the upgrade to ASG level from D-2. It's American Jessica Neuwirth, whom Inner City Press questions on camera in April, vidoe here from Minute 40:05. One UN human rights expert has expressed disgust at the way the Secretariat has tried to upgrade the post, a promotion through the budget process. Only at the UN. Update of 9:21 p.m. -- the crowd outside Conference Room 8 has grown; President of the General Assembly Ali Treki has descended again, and still to no avail. Inner City Press is asked: why are you the only media here? Later a camera crew comes. But they are covering neither scale of assessments nor human rights. They are here, it seems, by mistake, asking Treki about the UN tribunals for Rwanda and Yugoslavia. Inner City Press asks the crew: did he say anything useful or useable? No, is the answer. Will the results in Conference Room 8 be any better or more authentic? Or is this all just theater? Update of 9:34 p.m. -- a PGA staffer tells Inner City Press that a deal is near on Bahrain and Bahamas. He calls it a "transitional arrangement" from Classification B to C. Classification C, he says, was set up as a compromise in 2000 under then U.S. Ambassador Holbrooke, as a way to "shut up" Kuwait, the Emirates and Singapore, so Holbrooke could bring about some other reduction. Another diplomat marvels at how little the U.S. Mission says now. "When Rice is not in New York, you don't hear anything," he says. "The others used to be allowed to talk. Now they are not." Ambassadors strain in the doorway of Conference Room 8. It is untransparent, but something is afoot. Update of 9:42 p.m. -- in the corner by Conference Room 4, U.S. deputy Alejandro Wolff speaks with G-77 members. Afterwards, Inner City Press is told by G-77 that Bahrain and Bahamas will be put into Classification C, with its 7.5% discount, for three years. What about the human rights liaison upgrade to ASG? G-77's chair in New York scoffs. Why do we need another useless ASG? We will vote with India! We'll see. Update of 9:47 p.m. -- a crowd comes out of Conference Room 8, with shouts of "Conference Room 4! We'll go to Conference Room 4!" It is the Group of 77, almost 77 of them now, going to plan strategy. "It's percolating," a G-77 member in Classifaction C tells Inner City Press. "Like the coffee." 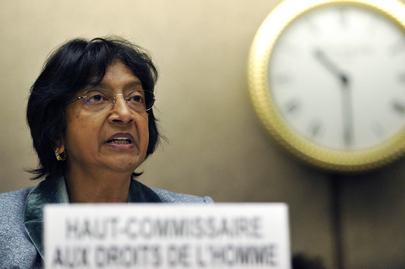 Update of 9:54 p.m. -- while the G-77 and EU consult, Inner City Press has received the following predictions from perhaps the best placed source: India will NOT call for a vote on the human rights liaison upgrade to ASG, even though "Navi Pillay has not made the case for the upgrade." The argument has become that there are six or seven "development" USGs in New York, and none for human rights. Second prediction: Israel WILL call for a vote opposing the Goldstone report follow up. But a Middle Eastern source says Israel does not have support from the usual places for this. Nonetheless, a vote is predicted. Syria, too, is predicted to back down on calling for a vote on Roed Larsen's mandate. This is perhaps wishful thinking by the source. He is correct, however, in diagnosing that unresolved political issues rear their head in the budget's eleventh hour. Update of 10:27 p.m. -- Finally, there are numbers. How much would the Permanent Five members of the Security Council have to pay, if Bahrain and Bahamas are allowed to shift down from Classification B to C? $300,000, is the answer from one of the P-5. 50% or so to the U.S., 15% each to France and the UK, the rest Russia and China. "But it's the principle of the thing!" the P-5, as well as Japan and others, say. But principle left the station in 2000, which the artibrary Classification C was set up to solve some other political problem. UN Controller Jun Yamasaki is now down in the basement. Inner City Press asks him "what for." He agrees that "the scales" are up to the member states. But so it is the ASG upgrade? The Goldstone report follow up? Inner City Press asks Israel's representative: will you call for a vote? They say you are threatening to do so. He replied, "It is not a threat. And it is more than a follow up." And so that train, too, has left the station. Update of 10:35 p.m. -- in this micro issue, of $150,000, stop the presses. Inner City Press asks the P in the P-5, "if Bahrain and Bahamas are reduced, does it cost you $100,000 or $150,000?" The answer is, "It's not sure that Bahrain and Bahama will be reduced." Could be a long night. Update of 11:10 p.m. -- the word is, Bahrain and Bahamas will get moved to Classification C, but not in the resolution. Rather, they will get a letter of guarantee from the President of the General Assembly. On the overall scale of assessments, Russia has made a new proposal. But G-77 is not backing them up: every country for themselves, it's up to you. Everyone is eating pizza and waiting for another paragraph to be written. Update of 11:38 p.m. -- amid talk of an "agreed scenario," Ambassadors huddle in front of Conference Room 7: Sudan and Singapore, the U.S. and UK. This is how deals are cut at the UN. But even as typing this up, Inner City Press asks Kazakhstan's Ambassador: are you happy with how the Russian proposal has been addressed? No, is the answer. We will be putting it to a vote. We are not happy. She is eating La Vache Qui Rie cheese on Breton crackers. The room is full of smoke. Update of 12:10 a.m. -- Mexico clarifies that it previously supported Russia's one year proposal, but fell away when Russia changed it into a proposal about market exchange rates. Now, alongside Kazakhstan and some others, Ukraine (Mexico says) is supporting Russia's position. Hmm. Ali Treki flashes Inner City Press a thumbs up, it's done. There will be at least two votes called for. And there is more to be said, not only about the budget. But budget first, in this space, when the Fifth Committee votes. Update of 12:45 a.m. -- Delegates stand in line in Conference Room 3, waiting to get their copies to vote on. A European representative, saying "good night" to Inner City Press, explains that her mission works the budget in three shifts. The skeleton crew is coming in for the vote. Inner City Press asked the Committee chairman, Peter Maurer of Switzerland, how many countries he thinks will vote along with Russia. I don't know, he says. You will see. Update of 1:09 a.m. -- finally, the two scales of assessment resolutions are distributed. The peacekeeping scale says, in paragraph 16, that the GA "recognizes the concerns raised by Member States, including Bahrain and Bahamas, regarding the structure of the levels." Both have been assured they will get a side letter from the President of the General Assembly. Inner City Press asked at the document window, but where's the Russian amendment? The response: that's a different story. Still the curtain that covers the voting board has not been drawn back. But Maurer has gaveled the meeting to order. Update of 1:13 a.m. -- the first items called by Maurer are the international criminal tribunals for Rwanda and the former Yugoslavia. Jun Yamasaki speaks on changes in rates of exchange. Update of 1:22 a.m. -- Maurer asks again and again, are there any comments? Are there any objections? I see none, it is so decided. Does any delegation wish to make a statement after the adoption of the draft resolution? Eritrea's seat is empty. 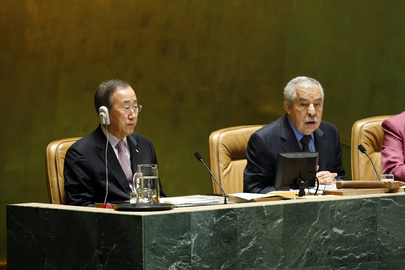 We will be writing about their speech outside the Security Council (much) earlier today. And now India is taking the floor. Update of 1:28 a.m. -- "India's commitment to multilateralism... we have been participating.... fully aware it's 1:30 a.m., one and a half hour beyond when we should have completed our work... without wishing to make matter divisive... I wish to inform you, we would not wish to press for the amendment we had mentioned earlier in the day today..."
And so it is adopted, without amendment. There is applause. Update of 1:36 a.m. -- now Israel is calling for a vote on the Goldstone report. A/64/7/L.3 of ACABQ about the Goldstone report. "As a matter of principle... we cannot support... established with predetermined conditions." In favor 136, against 2, abstain 3. Guatemala says it made a mistake, wants to be green. The U.S. has voted in favor of part 5... The U.S. supports creation of expert on Sudan, DPRK and Myanmar... Somalia... We will not reiterate our views, it does not change our view of the report. Update of 1:49 a.m. -- this table is the same as Russia distributed in Room 5 on December 1.... Now Kazakhstan is taking the floor, excusing Maurer for calling her "sir," "it's 2 a.m.," she says. The mic is not working. "Sabotage," Maurer jokes. She begins in Russian. Update of 1:52 a.m. -- she says Iraq is given special treatment, "that is understandable," why would poor Kazakhstan as a developing country have to pay this... I propose that the proposal of the Russian federation, we put it to a vote today... We support it, the amendment to item 136..."
Update of 1:55 a.m. -- Japan says the agreement is for scales to remain the same for three years, with review "urgently." Japan urges opposition to the Russian amendment. Update of 1:59 a.m. -- Ukraine, which Maurer called "The Ukraine," says it supports Russia's amendment not because it benefits Ukraine, but because it's right. Now Sweden, on behalf of the EU: "against the proposed amendment by the Russian federation." Update of 2:04 a.m. -- Russia loses, 22-85-27. Russia's supporters include Nicaragua and Venezuela, Laos and Mongolia , Serbia, Qatar, Myanmar and so forth. Afterwards Russia notes that this is not a consensus resolution. Belarus trashes the Committee on Contributions as biased. Update of 2:07 a.m. -- looking back at the Goldstone vote, now that the voting sheet has been released, when you take away Guatemala's erroneous vote, Israel has only three abstainers in support, and these are surprising: Cote d'Ivoire, Cameroon and Benin. Say what? Update of 2:09 a.m. -- on scale, Maurer reads out it is the understanding of the Committee that Bahamas and Bahrain will be treated as Category C. And there are no comments -- except Bahamas, which wants to thank its supporters. Update of 2:13 a.m. -- Sweden says the EU accepted the Chairman's proposal on the peacekeeeping scales -- that is, the letter from the PGA to Bahrain and Bahamas. Update of 2:15 a.m. -- Maurer says it's over, come to the GA. He thanks the bureau. "it's not the moment to get philosophic... to GA and then sleep before daylight starts." Update of 2:17 a.m. - Mosves congratulates Paul, 17 years serving the 5th committee, there is applause. 35 minutes gap before the GA.
Update of 2:41 a.m. -- in the Delegates Lounge, there are drinks and congratulations. Mosves says he is the only Committee secretary allowed in to the most sensitive negotiations, because he has no position, only wants to help them get where they want to go. Other committees are not binding, he said. In the 5th it must be by consensus. He tells a PGA staffer, see I brought it in earlier than last year, when it was 8:01 a.m.. The staffer later scoffs. USG Angela Kane has headed off, no need to wait for the GA. Will Russia raises its issue again in the GA? Inner City Press is told no. Israel will, yes. With only three abstainers? Update of 3:12 a.m. -- Ali Treki gravels the meeting to order. In the TV booth, there are no headsets for translation. It sounds like he is singing. Update of 3:17 a.m. -- underneath TV booth 14 there are many empty seats in the GA. Comoros, DRC, Lesotho, Paraguay... Not voting in the Budget committee earlier tonight (or this morning) were, among others, Belize, Botswana, Burundi, Cape Verde, Central African Republic and Chad. The Comoros, El Salvador, Equatorial Guinea and Eritrea.... and on from there. Update of 3:34 a.m. -- after the resolution criticizing Myanmar's human rights record passes 86-23-39 (Norway asked that it's vote be changed to yes), the Solomon Islands speaks up to say that due to pressure it is changing its position from that in the 3d Committee. Another change: on Israel's vote, the DPRK (North Korea) abstains, in seeming support of Israel -- or simply against any human rights mandate anywhere. Update of 4:07 a.m. -- the Kazakhstan Ambassador brings it to a close, be well, be happy, be lucky! The voting screen depicts a green and orange Christmas tree. Update of 4:14 a.m. -- the Japanese delegates are still at their GA table, talking on their cell phones. UNITED NATIONS, December 23 -- The issues outstanding in the UN budget process involve not only the request by Bahrain and Bahamas to pay less for peacekeeping, exclusively reported here by Inner City Press, but how often to review the wider "scales of assessment." The European Union wants a review within a year while the Group of 77, pointing at a ministerial statement from September, says that things should remain as they are. Inner City Press asked General Assembly President spokesman Jean Victor Nkolo to confirm that only these two "scale of assessment" issues remain open. Nkolo said this was the case. But Budget Committee sources tell Inner City Press that among other issues pending is the proposed upgrade to Assistant Secretary General of the liaison in New York of the UN High Commissioner for Human Rights. India has adamantly opposed this, saying it will call for a vote (but not, it is said, ultimately block consensus). Mexico and Japan are said to have also joined India in raising concerns about upgrading of the Human Rights post. Whether this reflects antipathy to human rights, or budgetary or administrative concerns is not clear. Inner City Press asked U.S. Ambassador Susan Rice for the U.S. view on the budget, if she is satisfied with her Mission's level of involvement, and whether like at least her last two predecessors she believes the UN budget is too piecemeal, not transparent enough. Ambassador Rice replied that of course she is satisfied with her Mission's performance, and that the U.S. is very involved in making sure Missions get enough resources. But what about the when to review the scales of assessment? More fundamentally, what about the piecemeal budget process in which "add ons" comprise more than $1 billion? Watch this site. 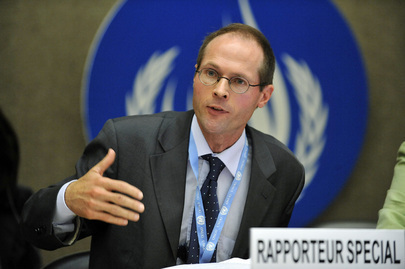 Footnotes: Inner City Press also asked Ambassador Rice if the U.S. favors the call for a new human rights special rapporteur on the Congo for the UN Human Rights Council, which the U.S. has joined. Ambassador Rice replied that human rights are important, but did not directly answer if the U.S. would use its seat on the HRC to push for a Congo rapporteur. UNITED NATIONS, December 23 -- In nighttime UN budget talks on Tuesday, Western countries faced off with the Group of 77 and China as to whether Bahrain and Bahamas should pay a lesser assessment for UN peacekeeping missions. Meanwhile, despite talk of "zero growth" budgeting at the UN, sources tell Inner City Press that the regular budget will rise, it is only a question of how much. The much hyped scale of assessments appears set to remain the same. The reformers, as they call themselves, who want to shift assessment to reflect the rising power of China and India and others, now only want to change the review process. But the G-77 wants that to remain the same. Special Political Missions, including the ever more controversial UN Mission in Afghanistan, are another bone of contention. An attempt is being made to forestall any targeted cuts. Click here for draft SPMs draft, exclusive to Inner City Press. At 7 p.m. on Tuesday, Inner City Press greeted the UN's head of Management as she left the building, with shiny Christmas gift bags. While she said she is "on call," delegates of member states remained milling around by the Vienna cafe. That will shut down 2 p.m. on Thursday. "We'll finish by then," a delegate told Inner City Press. Click here for draft scale of assessements for the apportionment of expenses of the UN peacekeeping operations. Bahrain and Bermuda want to drop from B to C, but C is strictly defined. Footnote: Up in the Delegates' Lounge, slated to close "for two years" at 7 p.m. on Thursday, there was grumbling about pretextual cost cutting by the UN, particularly in Publishing. As Inner City Press asked at Tuesday's noon briefing, ASG Franz Baumann has declared an end to paper copies of the UN Journal, which lists daily events. Many representatives of member states like the paper Journal, to tell them where to go. In meetings with staff, Baumann has claimed that 3.5 tons of paper is wasted each day. But workers say he's included cafeteria waste in the figure. The cafeteria will close, also with layoffs, on Thursday. 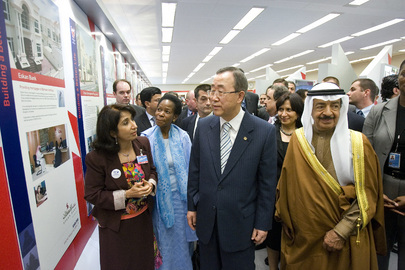 There is advocacy for Bahrain and Bermuda, but little for those who do manual labor in the UN. And so it goes.